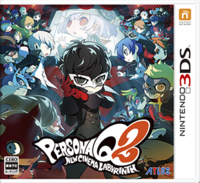 Earlier today, Atlus released the second official full-length trailer for their upcoming title Persona Q2: New Cinema Labyrinth, a crossover RPG featuring characters from Persona 3, Persona 4, and Persona 5. Those who plan on attending Tokyo Game Show 2018 will have an opportunity to try out the game for themselves at the Atlus section of the Sega booth. There will also be a special stage show on September 22 featuring the voice actor for the Persona 5 protagonist, Jun Fukuyama; Morgana (Persona 5) voice actor Ikue Otani; Persona 3 female protagonist Marina Inoue; and Yukiko Amagi (Persona 4) voice actor Ami Koshimizu. Finally, Atlus will be hosting a two-hour live stream on Niconico on September 21 at 7:30 PM JST with former AKB48 member Haruka Ishida playing Persona Q2. Check out the latest trailer for Persona Q2: New Cinema Labyrinth down below. The game is scheduled to be released in Japan for the Nintendo 3DS on November 29. There has been no word on a western localization as of yet. If you missed it the other day, Atlus shared all the character artwork for the game.